You must be a member of the Rome Forever Young Group to attend this activity. Would you like to join this group? Escape from the winter and give a present to yourself. It’s time to relax in the heart of Rome at Protected content and to take advantage of a special promotion for our rejuvenation of body and mind! Come and discover a new spa in the historical bank basement of the Hotel, Curio Collection by Hilton that preserved the old caveau of the bank. 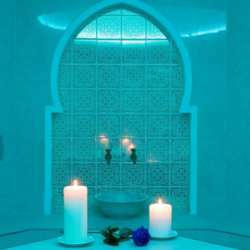 The Spa features a unique and exclusive hammam, a Finnish sauna, heated indoor pool Jacuzzi, massage cabins and a fitness room with Technogym equipment. Pay attention that if you want to join the promotion "SPA with Massage" you MUST make your own reservation for the 30’ massage contacting at Protected content and follow their cancellation policy. I suggest you to book your massage as soon as possible since the availability could change at any time. Note: SPA service include towels, flip-flops, hair-dryer and all amenities so you only need to bring your swimwear (and your gym clothing – shoes). Wellness area facilities are unisex and guests are required to wear swimwear. The closing time of the SPA is 20:30. There is no network inside the SPA so please ask the doorman or Reception of Aleph Rome Hotel how to reach the SPA. I will be waiting for you at the Spa Reception.